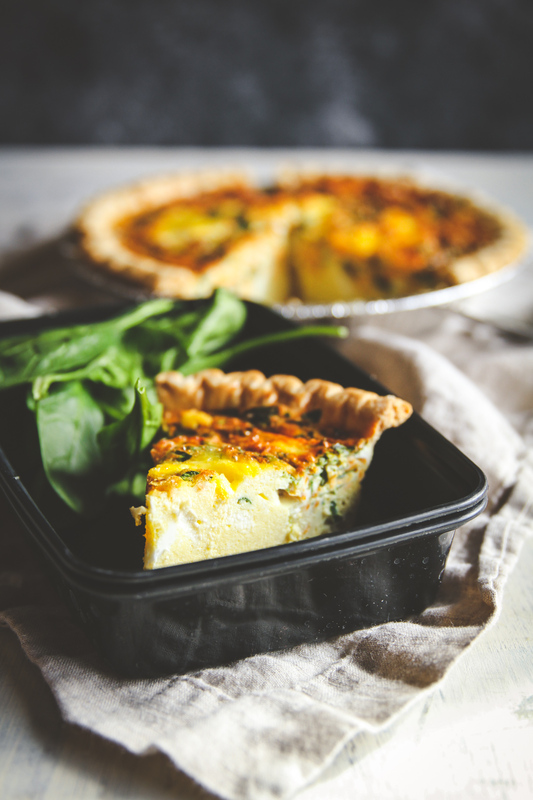 This make ahead freezer meals quiche is such an amazing recipe because quiche can be enjoyed as a breakfast, brunch, lunch or dinner! With crazy busy schedules and so many ‘to dos’ and things going on at work-after work- just life in general, I’m finding myself making more ‘make ahead’ and freezer meals lately. I’m really relying on my good ‘ole freezer so that when mealtime comes around, I’m not left wondering what to make. If I can open my freezer and pull something out to warm and enjoy, I’m calling that a win! But I don’t like things that taste like ‘freezer’ you know? Certain things just freeze and reheat well, like this quiche! 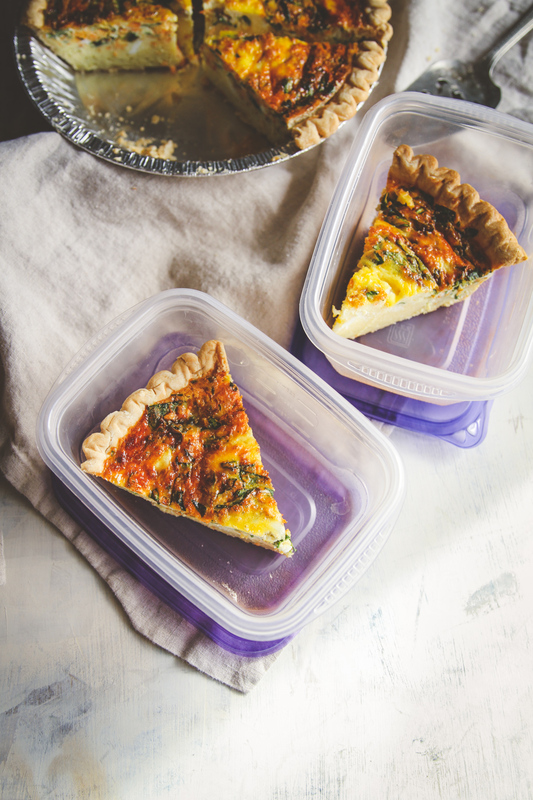 This make ahead freezer quiche is absolutely perfect, it’s a modified version of a recipe I included in my cookbook Fast and Easy Five Ingredient Recipes: A Cookbook for Busy People and one I’ve and made many many times. I make a vegetarian version with spinach/carrots/cheddar (or really any combination of cheese and veggies you’d like) or I make meat version with prosciutto and Parmesan cheese. Quiche always reminds me of my mom and growing up. We would always have quiche on Sundays or when guests came over, because it has a super quick prep time and then in could bake in the oven while we were spending time with family and friends. With Mother’s Day coming up, I’m thinking even more about my amazing mother, and I definitely thought this time of year was perfect to share it. Make and bake immediately – then serve and enjoy. 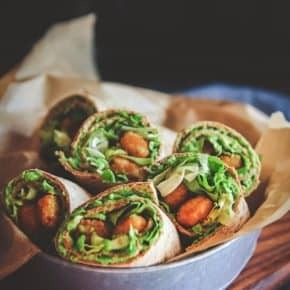 Make ahead- put in the freezer unbaked (just be careful transferring it so it doesn’t spill when putting it in the freezer) and then put it directly from the freezer into the oven. Make and bake ahead, then put it in the freezer in individual servings so all you have to do is warm it and go. I’ve included the different baking instructions for whichever way you decide you’d like to make this quiche, and I’ve included the ingredient lists for vegetarian or meat quiche. 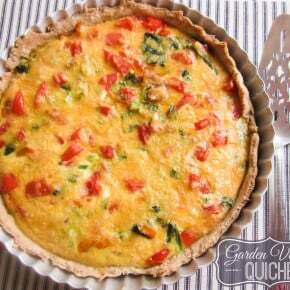 Whichever way you make this make ahead freezer quiche recipe, you’ll absolutely love it! It’s so perfect for when you don’t really feel like cooking and want something delicious to enjoy. It’s also suuuuper awesome for meal prep. You can just reheat a slice and enjoy it for a grab and go breakfast, lunch or dinner. 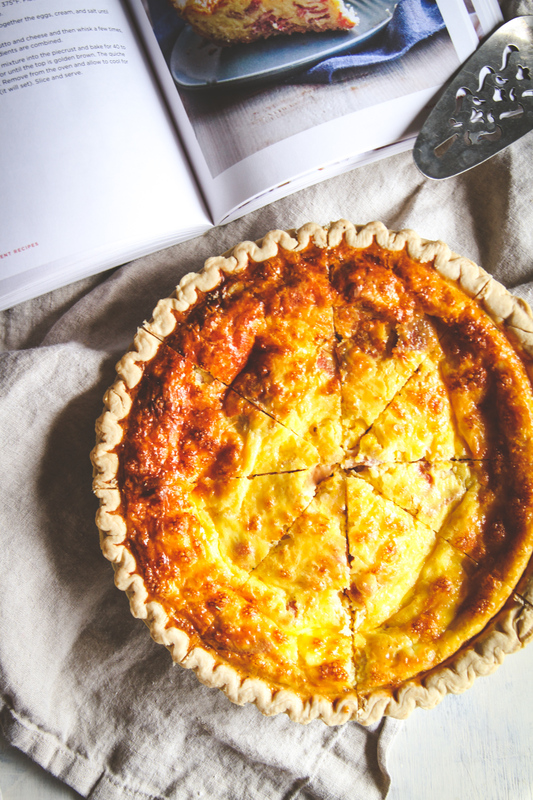 I’d love to hear from you in the comments section, what’s your favorite kind of quiche? Preheat the oven to 350°F. Place the piecrust on a baking sheet and set aside. In a bowl, whisk together the eggs, cream, milk, salt and garlic salt until well combined. For the meat version add in the cheese and prosciutto and then whisk a few times, until the ingredients are combined. Pour the egg mixture into the piecrust and bake for 40 to 45 minutes, or until the top is golden brown. The quiche will puff up. Remove from the oven and allow to cool for 5 minutes (it will set). Slice and serve. To make-bake-and freeze make the quiche using the above instructions. allow to cool completely. Then cut into 8 pieces. Wrap in plastic wrap and then aluminum foil and place in the freezer. 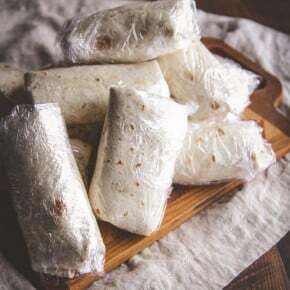 To warm, remove aluminum foil and plastic wrap, and microwave for 2 minutes, then allow to rest for 30 seconds, then enjoy! Place the piecrust on a baking sheet and set aside. Pour egg mixture into the pie crust. Cover the quiche with plastic wrap and then aluminum foil and place in the freezer. Be careful when transferring to the freezer (make sure there is a flat surface to put the quiche on! When ready to bake, preheat the oven to 375°F degrees. Do not thaw the quiche! Remove the aluminum foil and plastic wrap. Place foil loosely over the quiche and place the frozen quiche into the oven and bake for 50 minutes. Remove foil, and continue to bake for 30 minutes, or until top is golden brown. I have tried freezing quiche before and it came out watery or so dry. I am looking forward to this recipe. Yummy??? Before getting the recipe right, I totally agree, freezing quiche had its issues. Now I love it, hope you enjoy this recipe! Thank you so much for sharing that!!! Question! I have one of the Pillsbury frozen pie crusts and am wanting to freeze a quiche–am I supposed to thaw or bake the pie crust before I fill it? Or do I fill it frozen, and then the crust cooks when it’s baked later? Thanks! I froze the whole thing after baking. Eeks now what do I do? 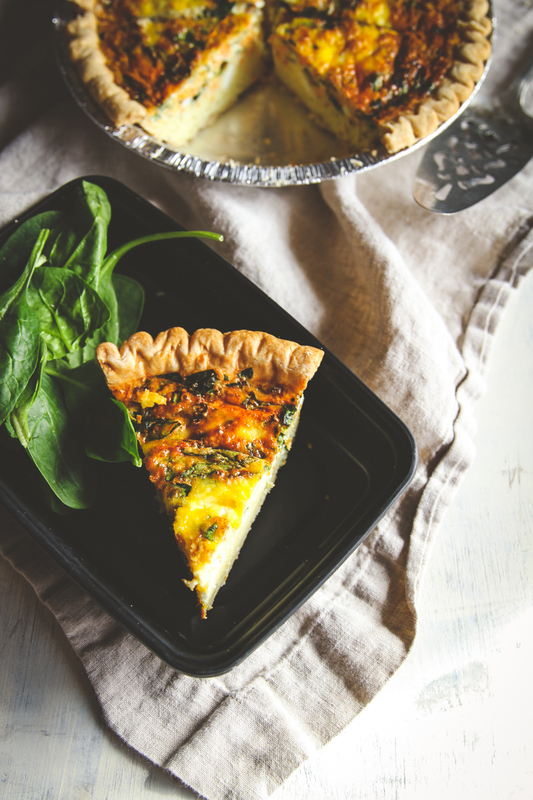 Yay – now you have a quiche in the freezer ready for whenever you need a quick meal. There are several ways you can warm it up. One is to just put the whole thing in the fridge the day before you want some, then pop it in the oven at 350 for 20 minutes with some aluminum foil over it so it doesn’t get too brown on top. The other method is to heat it in the microwave. Hope you enjoy!